I'm off tomorrow morning to Switzerland to stay with friends for the duration of the Diamond Jubilee nonsense, escaping from the relentless pressure to pay homage to a monarch who has basically done little but spend the last 60 years waving back at the crowds. The number of consumer products that companies are slapping a Union flag onto is getting ridiculous but it's all part of a carefully manufactured nationalist distraction exercise designed to make us spend more money and forget the country is in deep trouble, thanks to the bankers and their pliable political allies. Whilst I'm away, I can only hope that some of my many troublemaking friends find a way to refuse to follow the flag-waving, bunting-crazed crowd (and manage to avoid pre-emptive arrest like the Starbucks Zombies experienced before the royal wedding last year - I hope the current court case against the Metropolitan police is a success). 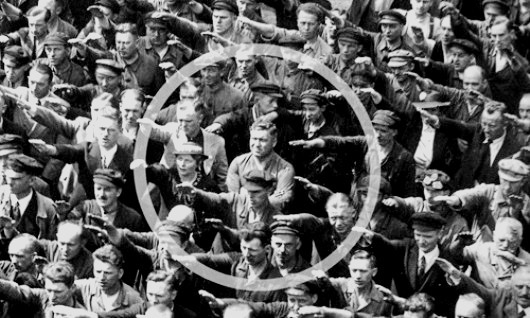 With this in mind, I offer as inspiration this famous photograph of August Landmesser, a German shipyard worker who dissented when everyone else made the Nazi salute. Now that's what I call stubbornness. Blogging will resume next week. Have a great republican weekend. This interesting report on NBC News in the States reveals that the Metropolitan Police's Air Support Unit, which is based at Lippitts Hill out in Epping Forest and that many of us can hear flying over east London on a regular basis, is using cameras on its three helicopters that are not only capable of seeing onto rooftops and other ‘inaccessible' places but are able to see very clearly "as much detail as they need to". What this "very dynamic" surveillance means in practice is the ability to obtain a "good clothing description" (using a x1000 zoom, known as a ‘spotter scope’) as well as "multiple number of recorders" to gather evidence that is "not just visual, it's audio as well." 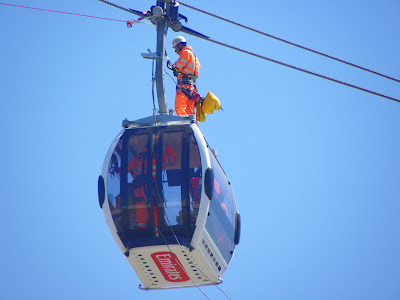 This will be put to use during the Olympics to "facilitate crowd movement and crowds dynamics". In public order situations, the Met says that helicopter crews "down-link live pictures to either the Central Communications Command or to small suitcase size mobile receivers so the incident commander can make informed decisions on the basis of real time pictures". It is the snooping function foreseen by Orwell that is the most significant next step for drones in our societies: with our cities and public buildings already saturated with surveillance cameras, we may fondly suppose that the state's monitoring of our daily lives has gone as far as it can go. But we ain't seen nothing yet. The Met's Sergeant Richard Brandon told NBC that the Air Support Unit's cameras will provide "reassurance for the public" but, like much of the security operation during this summer's Games, isn't there something alarmingly sinister about aerial surveillance that can pinpoint sound and the colour of your shoelaces from a kilometre away? This is a second guest post by the sports writer and Philosophy Football founder Mark Perryman. It also appears at Red Pepper.. John Carlos is at Stratford Picturehouse at 6.30pm on Tuesday 29 May in conversation with journalist Dave Zirin. Tickets are still available and I will post a report on the event next week. United on the Mexico podium by their fierce opposition to racism Tommie Smith, Peter Norman and John Carlos used the medal ceremony for what has become an iconic moment of public protest. Its durability as an image of anti-racism in sport and beyond is testament to the global platform the Olympics provided. Even before satellite TV and digital media, the dignified audacity of the three medal-winners became an overnight world-wide news story. The Sydney Olympics in 2000 offered another iconic Olympic memory of sport and race. As the twenty-first century began Eric Hobsbawm’s description of the role of sport in providing a popular expression of national identity amongst the debris of globalisation became increasingly relevant: “The imagined community of millions seems more real as a team of named people.” As part of this process a sporting contest can sometimes crystallise social or political changes within a nation. When Cathy Freeman, the Australian Aboriginal sprinter, streaked around the track to win the 400 meters gold medal, kitted out in an all-in-one skin-tight green and gold Lycra suit complete with hood, she was chased every inch of the way by the light of thousands of camera flashes capturing her moment of glory. This was more than an instant of supreme sporting achievement. For Australia’s Aboriginal community it represented recognition and inclusion from the majority white population - however temporary it ultimately proved to be. Inequality, discrimination, racism, and disputes over land rights didn’t disappear just because Cathy was a national heroine. Her success was the exception, not the rule, but for a moment it pointed to a different version of Australia. These moments of opportunity provided by sport are vital in constructing any kind of progressive conversation around issues of race and nationality. Especially in the wake of London’s 7/7, one day after the city was selected to host the 2012 Games, a caricature of multiculturalism has been used as cover to break with the kind of celebratory diversity that the Olympics bid had seemed, at least for one of those moments, to represent. In Singapore, as the London bid presentation approached its climactic ending, Seb Coe welcomed on stage thirty youngsters, “Each from East London, from the communities who will be touched most directly by our Games. Thanks to London’s multicultural mix of 200 nations, they also represent the youth of the world...” And what a mix too. “Their families have come from every continent. They practice every religion and every faith.” Was there any box in the table of diversity these kids didn’t tick? It was a compelling image of London as a global city. But this was a flimsy populism, a kind of corporate multiculturalism, a presentation of a cosy team picture of unity through diversity which obscured the realities of representation. As he paraded the youngsters ‘representing’ London across the Singapore stage it might have been useful to ask Coe, or even the kids themselves, a few questions: What was it like living in and growing up in Tower Hamlets, Newham and Hackney, among the poorest boroughs in the city? What jobs did their parents have, if they had jobs at all? What opportunities in terms of health, education and housing could they look forward to? How confident were any of them that they and their families would be able to afford the tickets to watch the Games they were on the stage to promote? The forces of integration and difference reflect a set of power relations and consequential resistance which, like the national identities they help to define, are always in motion. These help to portray the ways in which all national identities are never entirely fixed but a process in motion. Sport plays its part, a very important part, in this process, but its role is partial and over-hyped at the expense of examining why the black athletes who represent Britain on the pitch, in the ring, or on the running track are not replicated in anything resembling equal numbers on Trade Union executives, or on the front benches, or on the committees that run sport’s governing bodies. Writer on race and sport Dan Burdsey provides a poignant and powerful observation of how the racialisation of sport is often experienced. Apart from the athletes on the track, “You will often see a significant presence of minority ethnic people in the stadium: they will be directing you to your seat or serving your refreshments. The racialised historical antecedents, and continuing legacy, of these roles - entertaining or serving the white folk - should not be lost within the contemporary clamour of positivity.” An Olympic Park built at the epicentre of three of Britain’s most multicultural boroughs which is experienced in this way will expose much of the inclusion and exclusion which persist in our society, or at least it should if anybody cares to notice. On 29 April last year, the day of the Royal Wedding, the Metropolitan Police arrested, handcuffed and detained dozens of people across London pre-emptively 'to prevent a breach of the peace', a crime that none of them had actually committed. These arrests were an apparent attempt to silence a disparate group of republican and anti-monarchist dissent, which included activists Chris Knight, Camilla Power and Patrick Macroidan who planned to stage a mock execution of an effigy of Prince Andrew as a piece of street theatre In Soho. Others were people the police merely suspected of being protestors. Members of the ‘Charing Cross 10’ who were on their way to a republican street party, the ‘Starbucks Zombies’ who were arrested from an Oxford Street branch of Starbucks for wearing zombie fancy dress and a man who was simply walking in London was stopped and arrested by plain-clothes officers because he was a ‘known activist’. All of the claimants were released without charge once the public celebrations had finished. The Metropolitan Police’s actions over the Royal Wedding weekend reflect the increasingly heavy-handed ‘total policing’ tactics against all peaceful protestors, which appear to deliberately seek to dissuade people from exercising their right to free speech or to avoid participation in protest altogether. However, fifteen of the Royal Wedding ‘precrime’ detainees have been granted leave to challenge their arrests by way of a judicial review next Monday at the Royal Courts of Justice. If they succeed in persuading the court that their arrest and detention was unlawful, it may prevent the use of pre-emptive arrests and detention during the Diamond Jubilee weekend and this summer’s Olympics. The judicial review hearing will include three other cases arising out of the police’s actions over the course of the Royal Wedding bank holiday weekend,: two concerning raids on squats on April 28th by Metropolitan Police officers and the other arising out of another pre-emptive arrest of a minor on the day of the Royal Wedding itself. We have received reports from the trademark holder, London Organising Committee of the Olympic Games and Paralympic Games Ltd, that your account, @spacehijackers, is using a trademark in a way that could be confusing or misleading with regard to a brand affiliation. Your account has been temporarily suspended due to violation of our trademark policy. This is what makes the use of brand protection threats against a group like the Space Hijackers seem like deliberate repression of free speech. They are quite obviously taking the piss out of the way that, in order to satisfy corporate sponsors, there are 'Official Partners' for everything during the Games. It does appear that, given the chance, LOCOG would willingly commercialise and seek sponsorship for practically everything, even the act of protesting against the Olympics itself. However, it is hard to see how anyone could mistakenly believe that the Space Hijackers have genuinely been granted 'Official Protester' status, how they might stand to gain financially from sending up LOCOG's obsessive branding or how this has “the intent to cause loss to another”. Is there another genuine 'Official Protester' that stands to lose financially, or have I missed something? You really don't need to be a rocket scientist to see this is satire. It almost seems that the London organisers' lawyers haven't bothered to read section 4 of the 1995 Act on the limitations of its effect. But it also appears that LOCOG is only capable of seeing the Olympic symbols as a way for predatory commercial competitors to cash in on its brand – which itself is a damning indictment of how corporate and money-obsessed the Olympics have now become. There are two quite different and opposing views of the way protests and public order is policed in Britain and during yesterday’s ‘Kettle Police Powers’ conference, organised by the Network for Police Monitoring (NetPol), someone asked me a very odd question rooted in one side of the argument. Did I think it would be a good idea if the police started using ‘protest liaison officers’ to improve communications between public order officers and protesters? I’ll admit I was rather lost for an immediate answer. What did I think? Initially, I thought that anyone looking at the tone of the event’s programme and its speakers, or reflecting at the repeated containment and vilification of protesters over the last few years, really shouldn’t need to ask about the dubious benefits of ‘protest liaison officers’. One side of the argument, the mainstream position on public order policing – what might be crudely characterised as the ‘Liberty-HMIC’ viewpoint – is that there isn’t a deliberate attempt to clamp down on the right to protest in the UK or to treat all protesters as potential criminals. Instead, there is a failure to communicate and the misconduct and excess of a few officers, with the first fixed by protesters agreeing to talk more to senior officers and the latter by using the courts and the Human Rights Act to seek legal redress for injury or ill-treatment. 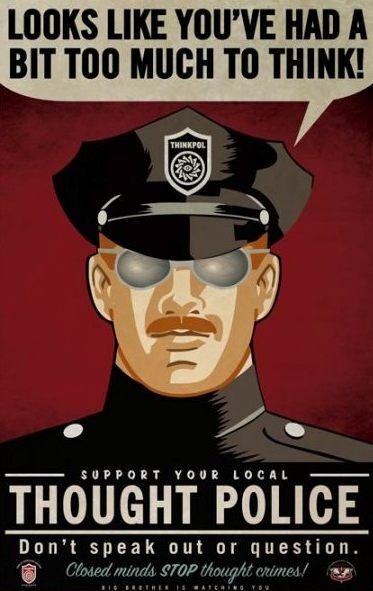 The opposing view – one I happen to share – is that negotiations with senior police officers have done little to stop heavy-handed policing tactics (especially when protesters are lied to, as they were at the Fortnum & Mason occupation), whilst systematic surveillance of activists and violent arrests during overwhelmingly peaceful protests places a greater responsibility on police than protesters to explain their actions. At the same time, fourteen years of court cases since the introduction of the Human Rights Act in 1998 has failed to prevent the introduction of a new repressive ‘total policing’ model. It has instead depended on individuals taking time, effort and often expense to seek legal redress after their rights have been denied, often with little prospect of securing anything more than a civil claim without an admission of liability. Inevitably, it has also often taken the struggle for an end to police misconduct away from campaigners and handed it to lawyers and judges. 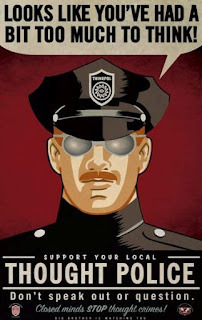 Instead of simply trying to hold the line against a rising tide of new police powers, this more radical position argues that the state needs to be forced into losing some of its powers and closing down operations like its indiscriminate data gathering, which are used primarily to undermine and disrupt the right to freedom of speech and assembly. Sunday’s excellent speakers were able to explain in great detail the scale of the problem facing protesters, local communities and football supporters experiencing tough public order policing. The session I shared with the documentary photographer Marc Vallée covered the range of draconian police powers that may be used during the Olympics, hopefully without scaring anyone into scrapping plans to exercise their right to protest or simply avoiding east London altogether over the summer. Marc also revealed the interest that the private sector is now starting to show anti-corporate protesters during the Games. 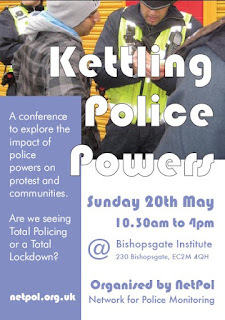 But as one of the people who helped organise the ‘Kettle Police Powers’ conference, I felt that what was perhaps missing yesterday was some genuine conflict, a greater clash of ideas. It feels as if we have now reached the stage where more and more people understand and accept the merits of the alternative position on public order policing – and maybe the time has come for the two different and opposing sides of the argument to properly lock horns. So next year, I hope that the Network for Police Monitoring might be able to persuade the director of Liberty, Shami Chakrabari, to debate what difference the Human Rights Act has made to protesters. And who knows? Maybe Sir Denis O’Connor, the Chief Inspector of Constabulary, would like to come and argue the benefits of ‘protest liaison officers’? On 8 March 1971, activists from a group called 'Citizens' Commission to Investigate the FBI' broke into an FBI field office in Pennsylvania and stole over 1000 classified documents, which they sent anonymously to a number of American newspapers. 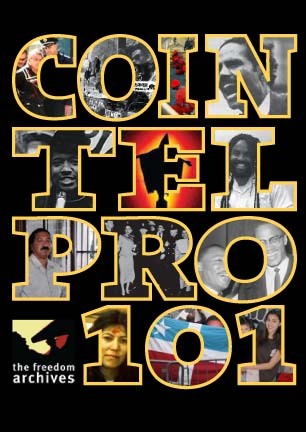 Most refused to publish what these documents revealed: the existence of COINTELPRO (an acronym for Counter Intelligence Program), a series of covert and often illegal projects conducted by the FBI, who had spied on, infiltrated, discredited and disrupted a huge range of US political organisations included anti-Vietnam war protesters, Native American groups and especially the Black Panther Party. The exposure of COINTELPRO revealed, in the words of Noam Chomsky, "a program of subversion carried out not by a couple of petty crooks but by the national political police, the FBI, under four administrations... aimed at the entire new left, at the women's movement, at the whole black movement, it was extremely broad. Its actions went as far as political assassination." US government counter-intelligence agencies had sought to deliberately destroy these movements for self-determination and liberation for Black, Asian, and Indigenous struggles, as well as attack the allies of these movements and other progressive organisations. Although the programme was 'officially' terminated in 1971, widespread surveillance and 'intolerable techniques' have continued, both in the US and in Britain and especially since the start of the ‘War on Terror’. So too have tactics designed to disrupt the right to protest, such as the use of agents provocateurs, entrapment, the misuse of stop and search powers and the creation of secret databases on known activists. On Thursday 21 June, Newham Monitoring Project is hosting the screening of a documentary at Stratford Picturehouse, which examines the history of COINTELPRO and its legacy. Claud Marks, the director of 'COINTELPRO 101,' is over from San Francisco and will join a panel to discuss the experiences of the 60s and 70s and what lessons we can learn for the present - particularly the intensive surveillance of campaigners and activists as part of the massive security crackdown planned for east London during this summer’s Olympics. Who Gets To See The Torch? Who Gets To See The Games? Beginning its long route around Britain, the Torch Relay is one of the few examples of decentralisation and free-to-watch events that could have transformed the 2012 Olympics into a Games for all. There is little doubt that the sight of the Olympic torch as it passes through a village, town or city up and down the byways, with photo-ops at famous landmarks will ignite popular interest and huge media coverage. But the scale of that enthusiasm reveals the lack of ambition behind the 2012 model for the Olympics. 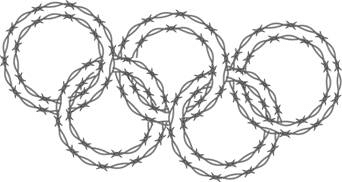 In my new book Why the Olympics Aren’t Good For Us, And How They Can Be, I propose Five New Rings for the Olympic symbol. The first, and most important, of these is decentralisation. As a mega-event football’s World Cup has its problems too with new stadia sometimes built with no obvious future likelihood to be full again once the tournament is over. But the singular advantage for the hosts of a World Cup over the Olympics is it is spread all over the country, and sometimes more than one. In this way the global spectacular becomes not only a national event but a local event too. The Olympics is an entirely different model, apart from the yachting and the football tournament every single event is London-based, most of Britain will have no contact with the Games except a fleeting glimpse of the Torch relay as it passes through. Decentralisation could have changed all this, and saved enormous amounts on new builds too. 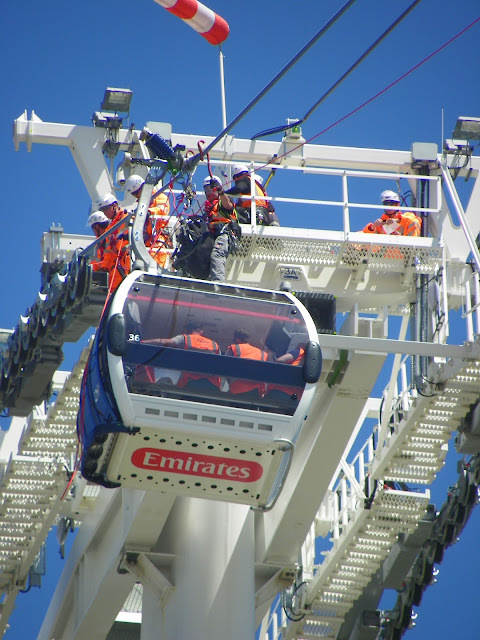 Glasgow and Edinburgh, Cardiff, Manchester, the North-East, Yorkshire and the Midlands all posses world-class stadia and arenas with huge capacities and multi-use possibilities. North Wales, the Lake District and parts of Scotland have the natural landscape perfect for events including the canoe slalom and mountain biking. Badminton is one of the finest three-day event venues in the world, its not in London so its not being used for 2012. Avoiding those costly new builds by using existing facilities would not only magnify the Olympics’ local appeal but vastly increase capacities too. With imaginative reconfiguring Cardiff’s Millennium Stadium could have hosted the show-jumping, Manchester’s Old Trafford and Eastlands stadiums plus the MEN Arena the boxing, between Glasgow and Edinburgh share the Hockey tournament , the Midlands Stadiums host the Beach volleyball, the North-East already hosts the Great North Run, why not stage the Olympic Marathon there, give Yorkshire the Football tournament and so on. Decentralisation enables this spread of venues with far bigger capacity than many hosting the events in London. And with Scotland, Wales, regions and cities hosting entire parts of the Olympic programme an effective campaign combining civic pride and participation in the adopted sport could have been mounted. Decentralisation could also afford an extension of the Olympic programme to include events that are both nation-wide and free to watch. Why not an Olympic Tour of Britain multi-stage cycling race, and a Round Britain sailing race. The potential for crowds lining the streets and the quay-sides to watch , for free, as the Olympics comes to their town or port would have been huge. 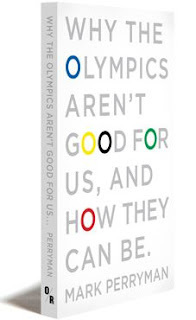 The book that I have written is neither anti-Olympics nor it it against sport, I am a fan of both. But I am opposed to what the Olympics have become, the false promises made on their behalf and the chronic lack of ambition in the way they have been organised. My argument is that a different Olympics isn’t only possible, but better. If our only experience of the Games in this much hyped once-in-a-lifetime opportunity to host them is watching them on the TV, well they might as well be anywhere else but here, and a lot less costly too. Mark Perryman is the author of Ingerland: Travels with a Football Nation and the editor of Breaking up Britain : Four Nations after a Union. Mark has written for a range of publications, including the Guardian and The Times, and is a regular commentator on the politics of sport for BBC Radio 5, BBC TV News and Sky Sports News. He is a Research Fellow in Sport and Leisure Culture at the University of Brighton. I popped along to the small but noisy Occupy London demonstration this afternoon, part of an international day of action in promised protests in cities in 82 countries. Here are a few photos - there are more here. Back in March, I speculated whether we will eventually see an announcement of the kind of “authorised protest zone” that has featured at every Olympic Games since Sydney in 2000. 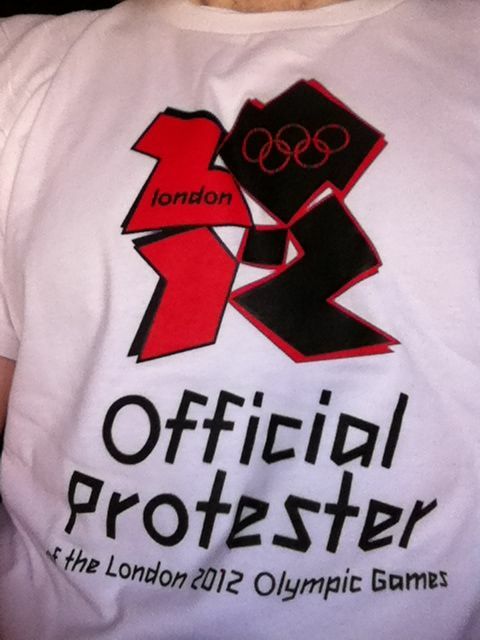 There's still no news on this, but I am now the proud owner of an 'Official Protester of the London 2012 Olympic Games' t-shirt (above) thanks to those perennial pranksters The Space Hijackers. As the official protesters of London 2012 the Space Hijackers don't want you to miss the opportunity to celebrate and be inspired. 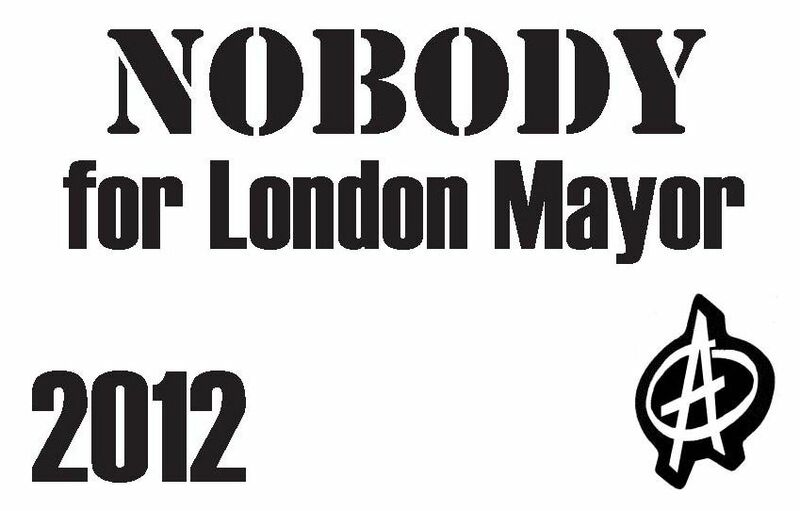 Taking place in venues across London you can now sign up to be part of the official protest of the games. You can make a start by registering your interest with us. 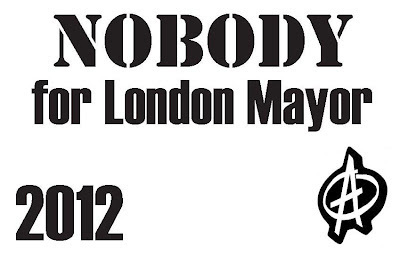 Tickets to the official protest will be released by us in Spring 2012. Tickets to officially protest will be dispatched in Summer 2012. Get ready to be part of a lasting memory of London and the Games! Anyone worried that they might face arrest wearing an 'Official Protester' t-shirt can relax - the London Olympic Games (Trading and Advertising) (England) Regulations 2011 do not apply to "advertising activity intended to demonstrate support for or opposition to the views or actions of any person or body of persons" or to "publicise a belief, cause or campaign". 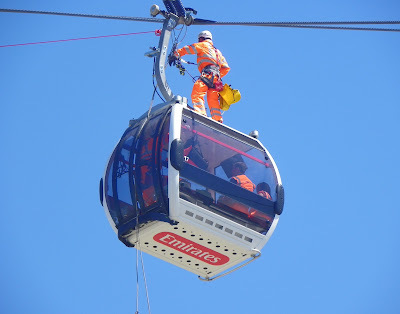 Of course, that doesn't mean that you will find it easy getting into an Olympic venue wearing one, or that G4S security guards with insufficient knowledge of their powers won't take exception. But if you'd like to become a proud owner of the coolest t-shirt in London this summer, then make a point of signing up to find out more. Kevin Blowe invites you to a conference on defending our fundamental liberties during the Olympics and beyond. 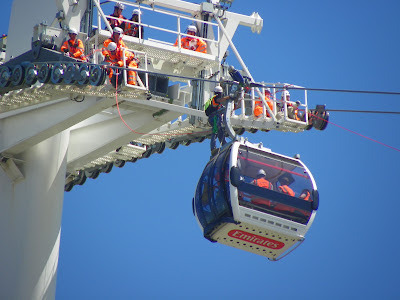 This weekend, with Olympics organisers testing preparations for the 2012 Games, LOCOG chair Sebastian Coe has been forced yet again to promise that London will not turn into a 'Siege City'. Plans to deploy surface-to-air missiles on residential buildings in east London are just one part of the gradually emergence of a huge security operation during the Olympics, with policing having the greatest impact on local residents and anyone planning to protest against sponsors like BP or Dow. The media is starting to wake us to the potential consequences of the capital’s lockdown: over the last ten days, because I have been writing about Olympic security, I have had numerous requests for interviews and comment from journalists all over the world. 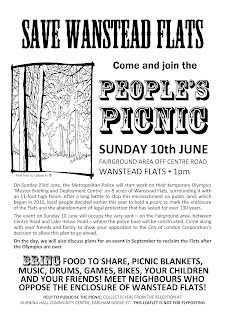 However, describing what we can expect from the largest police deployment in London since the Second World War is all very well, but the real question is what can we do in practice to protect the fundamental liberties of both protesters and local working class communities living on the doorstep of the Games? This is why an event on 20 May at the Bishopsgate Institute in London is one of the most important in the weeks preceding the start of the Olympics. 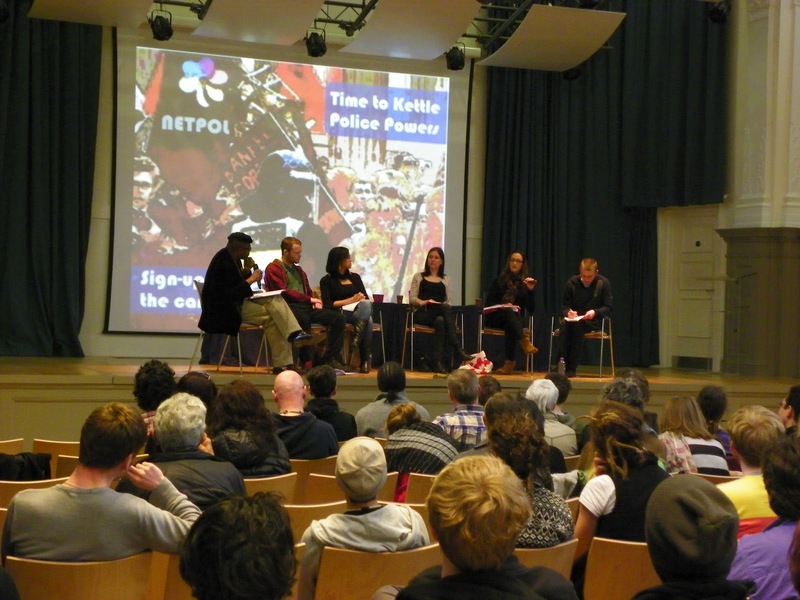 The ‘Kettling Police Powers’ conference is organised by the Network for Police Monitoring – which brings together activist groups like Climate Camp’s legal team and Green &; Black Cross with community organisations such as Newham Monitoring Project. It will provide campaigners, lawyers and others working at the sharp end of challenging unlawful, violent, racist or excessive policing with a chance to discuss the impact of London’s new ‘Total Policing’ concept and what that will mean this summer. Speakers include Alfie Meadows (who was struck on the head with a police baton during December’s student protests), Marc Vallee (a campaigning photo-journalist who was also one of the founders of the ‘I’m A Photographer Not a Terrorist’ campaign) and Rob Safar (one of the Fortnum & Mason 145 defendants), as well as the experienced lawyers Simon Natas and Kat Craig. 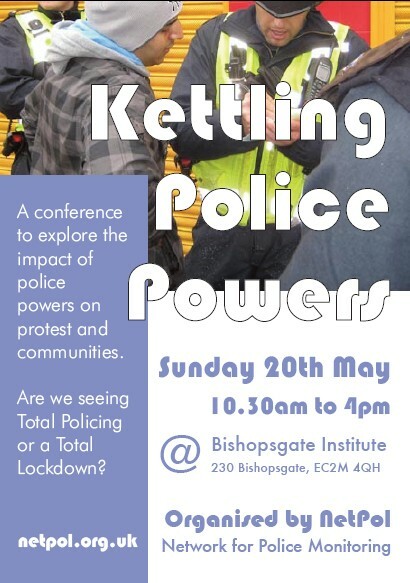 Most importantly, the conference will enable activists to debate how to best respond to the most draconian, heavy-handed policing operation we have ever experienced. I hope as many people as possible can attend. To register, visit the Network for Police Monitoring website. It may have been the endorsement of Lord Heseltine and Lord Adonis, or the prospect of Labour's appalling "eager diva" Liam Byrne standing as candidate, that swung the vote, but Birmingham was one of a number of cities that voted in local referenda to reject the idea of directly elected mayors. Nottingham, Manchester, Coventry, Bradford, Wakefield, Sheffield, Newcastle-upon-Tyne and Leeds all made the same decision as the people of Birmingham, with only Bristol voting in favour (with a turnout of only 24%). No wonder Liverpool City Council, unlike other cities, took the shameful decision to do away with consulting local people and plough ahead anyway. Hopefully, the results from Thursday, which mirror the 25 out of 38 earlier referenda that had already voted against the concentration of power into one person's hands, will fatally undermine the Tories' idea of a 'Boris in every city'. However, there was one result - in Doncaster - that provides an important reminder to those of us, like many residents of Newham, who already have a directly-elected Mayor and would gladly be rid of him. Doncaster seemed ripe for change: it was officially classified as a 'dyfunctional authority' by the Audit Commission, which criticised the English Democrat mayor Peter Davies and senior councillors for political in-fighting and placing their political objectives above the needs of local people. In 2010, the then Labour government intervened to take control of the town, appointing three commissioners to oversee a recovery plan. 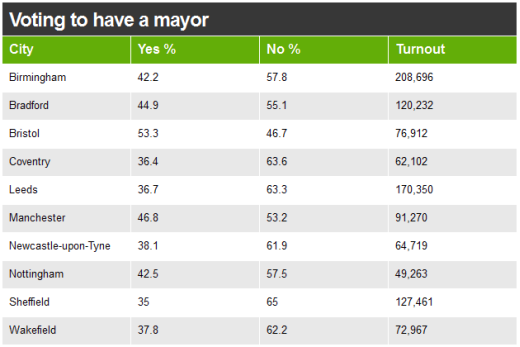 You would think that in those circumstances, the referendum on abolishing Doncaster's mayoral system would be worth a flutter on a 'no' vote. Instead, there was a decisive 62% of those who voted choosing to keep the current system. This decision may reflect a certain bloody-mindedness by Doncaster's electorate about the imposition of controls by central government but what I think this also proves, as I have argued before, is that managing to secure a new referendum in Newham to rid ourselves of Sir Robin Wales' fiefdom is not nearly enough. A successful 'no' campaign in any subsequent referendum will have to argue for something far more radical than a return to the way things were back in 2001 or it will fail to inspire people to get out and vote. In a posting in January, I made five initial proposals for what that radical agenda might look like. 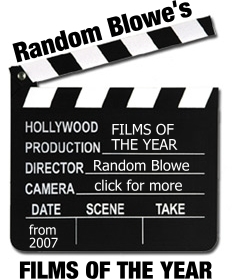 Please feel free to add your own suggestions in comments to this post. 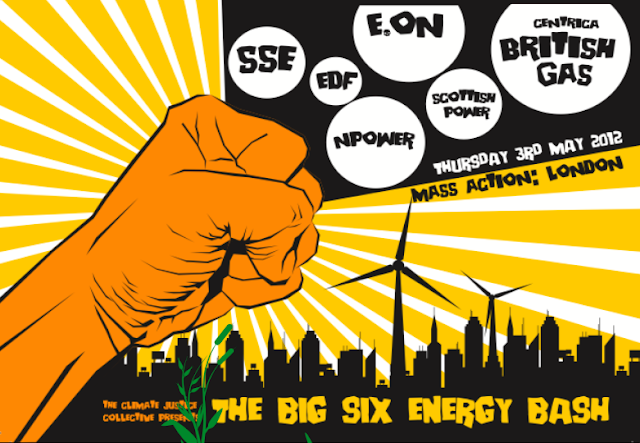 I will be speaking at the 6 Billion Ways event next Tuesday evening at the Rich Mix in Bethnal Green. Come along if you are free. Yesterday, the Metropolitan Police confirmed that a three month dispersal zone had begun in the Stratford area, which "will specifically cover Stratford Town Centre, including the Magistrates' Court, the main transport hubs in Stratford and the areas along West Ham Lane commonly known as the West Quadrant". Powers under the Anti-Social Behaviour Act 2003 to move on groups of people congregating in the zone began on 27 April, exactly three months before the Olympics opening ceremony. The police rather coyly add that at the end of the current period, they will "review the intelligence gathered and will consider making application to Newham Council for a three month extension", but it is pretty obvious that an extension will happen automatically. Coupled with confirmation that "local residents and businesses will also notice a marked increase in police patrols" supported by the Met's specialist public order unit CO20 (the Territorial Support Group) and Newham council enforcement officers, this is clearly a clean-up operation in advance of the summer's Games. So what does a dispersal zone involve in practice? Section 30 of the Anti-Social Behaviour Act says that police officer or Police Community Support Officer has the power to order a group of two or more people to leave the area and, if they don't live within it, to ban them from returning for up to 24 hours. Refusing to comply with an officer's direction or not following the rules of the dispersal order can lead to arrest and charge, with a conviction potentially leading to a maximum penalty of three months' imprisonment and/or a fine of £5000. In addition, officers have 'curfew' powers: young people aged under 16 are effectively prohibited from public spaces within the dispersal zone overnight, from 9pm to 6am, unless they are accompanied by a parent or a responsible adult over 18 years of age. An officer has the power to remove anyone within this age group that they find during these hours to their place of residence, unless there are "reasonable grounds for believing that the person would, if removed to that place, be likely to suffer significant harm." Dispersal orders potentially criminalise youthful behaviour on the basis of the anxieties that young people congregating in groups may generate among other people. As such, the power is potentially less concerned with the agency of individuals than the assumptions that are made about what they might do. For many, meeting friends and peers in local public spaces constitutes a fundamental aspect of developing their sense of identity and control, as well as providing space in which to forge their independent capacity to manage risk and danger. With the Olympics fast approaching, the underlying fear of young people from Newham scaring visitors and upsetting the drive for the 'perfect Games' does seem like the major motivation for creating a dispersal zone this early. It is as much about sending what JRT describes as a 'symbolic message' - mainly to stay away from public spaces in Stratford. The reality, though, is that this message is unlikely to succeed - many young (and not so young) people are are likely to head towards the area after 27 July, whether they have tickets for Olympic events or not, out of curiosity and excitement generated by the relentless publicity for the Games if nothing else. However, when coupled with other stop & search and anti-terrorism powers and the huge number of police and private security around Newham over the summer, the dispersal zone is clearly seen by the Met as an important element in the expected lockdown of Stratford for the duration of the Olympics - one that could lead many young people to unexpectedly find themselves in court if they don't fully understand their rights. Following on from the report that the army plan to to site a ground-to-air missile battery on the roof of the private apartment block in Bow, other locations were revealed yesterday - and one is very close to home. 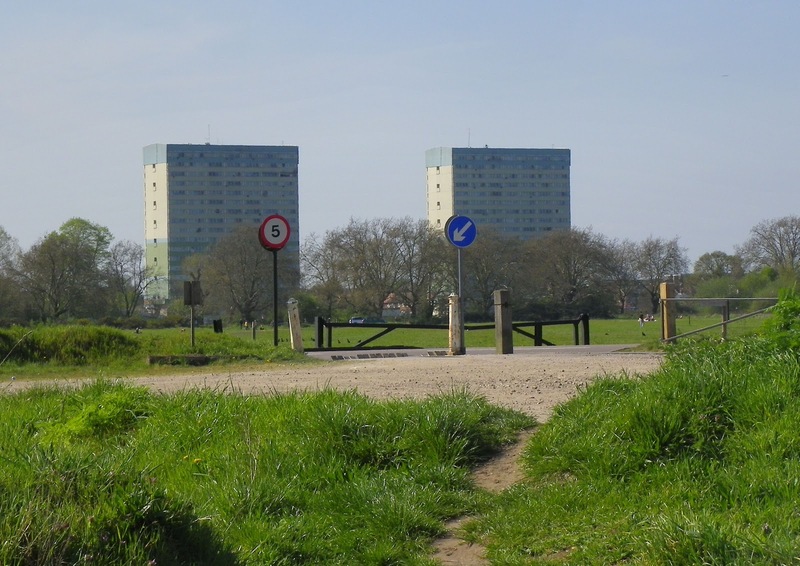 The Fred Wigg tower block in Leytonstone is a landmark for residents of Forest Gate - it is one of the two just off of Harrow Road that look across Wanstead Flats (on the right in the photo above - the other is John Walsh Tower). So as well as having a massive Olympic police station, we may also have a Rapier missile launch site right on our doorstep. It keeps getting better and better, doesn't it?